New Zealand Diamond Sangha, Golden Bay, New Zealand. Fri 6th July – Free Introductory Talk and Potluck Meal. 6-9pm at the home of Jo Campbell and Sean Weaver, 29 Central Takaka Road. Sat 7th and Sun 8th July – Retreat at Shambhala, Golden Bay. 8.30am till 5pm. Please bring lunch to share. Cost $50 (part Hands possible) + Dana (koha for teacher). This retreat is non-residential. However accommodation can be arranged if required. People can attend either just Friday night or the whole event. There is also an optional event on Monday. The retreat will include introductory talks, guided meditations, walking meditation, and opportunities for a private interview with the teacher. Jo and Sean will also host workshops on 'zen off the cushion', exploring its relevance to everyday things such as parenting, creativity and compassionate environmental action. Children: We welcome families and would like to make room for parents to attend retreats. Please talk to Jo about this. There may be an option for childcare shared between participants, or for part time attendance for parents. Shambhala is 16kms from Takaka towards Collingwood on Highway 60. Take small road on right 100m before Mussel Inn, and follow the signs. Transport to Shambhala from Takaka can be arranged. Essentially Zen is a branch of Buddhism that developed in northern Asia. 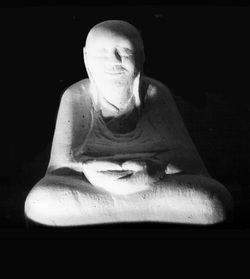 Zen, as a word, means simply “meditation” and it first developed 1500 years ago as part of Mahayana Buddhism in China. It most flourished between 900 and 1200 AD and then spread to Korea and Japan. The Zen masters who came to Europe and America in the 1960s were mainly from Japan. However the traditions we now follow are distinctly Westernised, particularly in the Diamond Sangha, which as a lay tradition has left behind many of the monastic features of Zen. Our main focus is on deeply settled sitting meditation alternating with walking meditation, and we aim to bring the same vivid quality of attention to all other activities in daily life. The Zen attitude is “If not now, when?” Our time alive is utterly precious and will never be experienced again. Zen is much more practice than theory. Developing one’s own personal practice can lead to living more serenely and wholeheartedly in each moment.